Both my parents are in a nursing home and have been for the last three years. 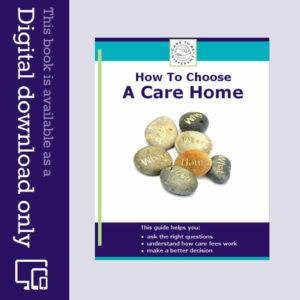 It’s heartbreaking to see anyone have to leave their home and go into care. With two parents in that position, the last three years have been very, very difficult. My parents are in a nursing home because they are ill. And yet I, as their daughter, have had to fight tooth and nail for any kind of help from the NHS. It has been an exhausting, infuriating, devastating and lonely process for much of that time. Friends have been wonderful and have kept me going when it seemed that the whole ‘system’ was conspiring against me. In the UK when you’re old and ill, the state often refuses to help you when you need it most. When the doors to care close on you, it’s difficult to know whether to knock harder on them, give them a push or to give up and go away. My own advice for any relative would be to kick the door down with both feet. 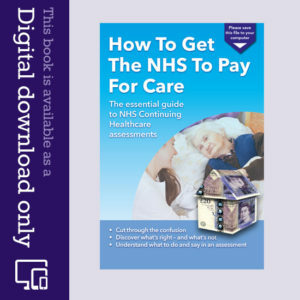 The NHS is supposed to step up to the mark for elderly people when they’re ill and provide NHS Continuing Healthcare, and yet it seems to take blatant advantage of the very people it’s supposed to help. It washes its hands of them. It is age discrimination at its absolute worst. Elderly people in care who have no one to fight for them (or even if they do have someone to fight for them) are fleeced of their savings and have to sell their homes to pay for care that should be provided by the NHS. It is sinister. People are not in a nursing home for fun. They are there because they are ill.
Social Services are likely to say that it’s nothing to do with them – and will often not even provide advice on what to do. Care homes often say that funding matters are nothing to do with them, and many do not proactively notify the NHS that someone in their care needs to be funded. And the NHS seems to put up the shutters at the earliest opportunity to wriggle out of parting with any money. It means the elderly person who is frail and ill becomes a pawn that no one wants and no one respects. The government hopes it can rely on the march of time. It hopes the person will be dead before it has to put its hands in its pockets and cough up what is legally required of them. The long-taught advice we’re all given to ‘save for a rainy day’ is the worst advice imaginable. If you have any kind of savings over the current savings thresholds – including the value of your house – your assets become easy prey. The state will attempt to take them away – often illegally. That has been the case with my parents. It’s a cliché, but it is, literally, criminal. Over their lifetime elderly people have often paid the most tax to support a ‘system’ they thought would repay their loyalty and investment, and yet they are utterly betrayed. My parents shared a cramped room at the care home initially, which cost them £4,000-£5,000 per month in total. If they’d had their own rooms at that time, it would have cost over £7,000 per month in total. Paying that out every month quickly decimates anyone’s financial buffer – a buffer that people work their whole lives for. It also denies people the fundamental right to leave their money as a gift to their children or to charity when they die. I spent about 18 months fighting to get back the money effectively stolen by the NHS on behalf of my mother – money we’d had to pay out in care fees because she is ill. I wrote reams of argument in letters, countering each ‘no’ from the NHS with further argument, all backed up by my own extensive research into NHS legal responsibility and duty. It ended with an independent hearing at the Strategic Health Authority in December 2007. I’m delighted to say that, eventually, I won. It meant that my mother’s care fees were refunded to her for a large chunk of the time she had been in care. When I heard the news, I sat and cried for a very long time. It was a mixture of relief, exhaustion and anger at what we had been put through. Intermingled with the huge love I have for my mum is the knowledge that she is so vulnerable. I was the only person who could fight for her. I’m grateful to have found the stamina and determination to keep going, even when everything seemed futile. If the NHS thought I would give up and go away, they were very wrong. The scars of battle are deep and distressing. The fight is a huge drain on time and energy. I am now fighting for my father, too – and I will win. Well done. I am experiencing similar. Told to sell home to pay for care home fees when social services did nothing to get my mum out of restate. I bought my mums house from her legally through her own solicitor in order to get her back home myself and her money could pay for privte home care. Later found the council would have funded this home care if they had bothered to attempt to get her home. Her health has declined and a stroke along with dementia has meant that care at home is too complex and is still in the nursing home. Her money has run out and Funded Nursing Care has been refused and council now questioning the house sale. Seems they want it all there own way. They had no interest in my mother when knew she owned her home. Your story has given me some inspiration to fight against thie tyranny of this system. The emotional drain can never be replenished and i fear the toll it will and already has taken will be detrimental to my family. Bless you.